Wot-tac is a boat shaped device. It has a compass mounted on the bow, and a centrally mounted dial etched with 360° markings. Please note that the dial has anti-clockwise markings – this is deliberate. 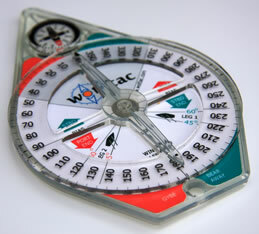 The wot-tac can be used by dinghies and keelboats. whether a gybe or bear away set is preferred on a windward/leeward course after a wind shift. Wot-tac will take away the guesswork from knowing where the wind will be – saving you precious minutes.